Smoke alarms are an early-warning system designed to alert you to the possible presence of a house fire. Replace the batteries every six months, and check the units once a month to ensure proper operation. A beeping alarm means that there is a problem with the unit, which typically is a dead or dying battery. The battery is necessary for proper operation. Removing the battery does not stop the beeping on most devices. Stopping the beeping requires discharging the system. A smoke alarm system is typically linked by electric cables joining all the alarms. 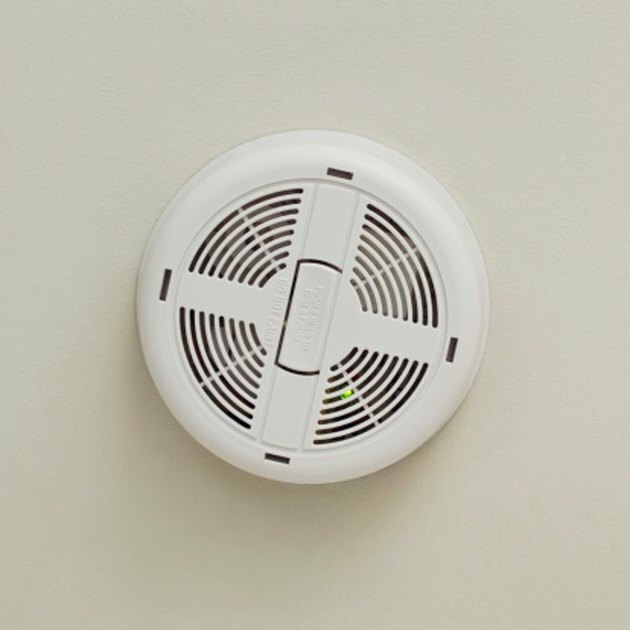 Disconnect each smoke alarm from the wall or ceiling mounts and disconnect the wires. Remove the batteries from each unit and press down the "Test" button until the beeping stops. Pressing down the button discharges residual electricity in the unit. Install new batteries into the units. Reconnect any electrical wires and remount the units on the wall or ceiling. A green light will appear on the unit indicating that it is functioning properly. Replace the unit if the beeping continues.